Sports Girl | Lover of lefty pitchers, two-seam fastballs, and stealing home plate. Lover of lefty pitchers, two-seam fastballs, and stealing home plate. And the MONEYBALL verdict is… terrific! Glad Soderbergh didn’t end up directing because BENNETT MILLER knocked it out of the park. Brad Pitt’s great! The movie is loosely based on the Michael Lewis book of the same name, which is based on the reality of the Oakland A’s experimentation with sabermetrics in running their ball club during the 2002 baseball season. The biggest complaint I’ve seen about this film so far, is its representation of the fact, timelines, and portrayals of the characters. There is no doubt that this film was adapted with some creative Hollywood licensing, and for the folks expecting to see a documentary about sabermetrics, there will be disappointment. 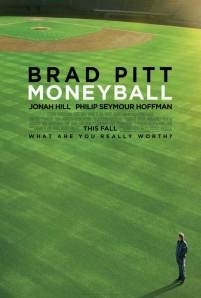 The movie’s focus is on A’s general manager Billy Beane (Brad Pitt) and Peter Brand (based on Paul DePodesta, played by Jonah Hill) as they attempt to turn the A’s into a winning ball club using Brand’s strategy of run production through sabermetrics. The dynamic of Pitt and Hill worked better than I had anticipated, and Jonah Hill brought comic relief in his comedic timing that makes average dialogue funny. I was surprised at how many laugh out loud moments this movie had. The dialogue was intelligent and witty, and there were bits of subtle baseball humor that I appreciated. I was skeptical of Pitt portraying Billy Beane, but overall I was impressed. He captured the gruff and loveable sides of Beane. He captured his nervousness and the relationship in the film between Beane and his daughter really brought a more human element to the film. Jonah Hill does a great job as Peter Brand, however, it’s unfortunate that the writers felt a need to geek up his character as much as they did. It’s no surprise that Paul DePodesta refused to let the movie use his name, as the character they created doesn’t seem to match his story too well. While Beane and Brand’s characters are well developed, Philip Seymour Hoffman’s portrayal of Art Howe seemed lacking. While his character played a smaller role in the film, who served largely as the antagonist in the sabermetrics experiment, it was difficult to watch an actor as good as PSH go underutilized. As for the baseball parts of the film, “Moneyball” does a good job of staying accurate to history (with a bit of creative licensing, of course). The players and the story lines they follow are accurate to the A’s season, including a great performance by Chris Pratt ( of Parks and Rec fame) as Scott Hatteburg. From my perspective, it was nice to see how accurately they handled the A’s losing/winning streaks, and the use of actual game footage was very well done. For giggles, I checked the box scores from two of the games used in the movie, and all of the base runners, position players, and pitchers seemed accurate as far as I could tell. As for the sabermetrics, there’s not much of that in the film. However, the script is cleverly written and some of the principles of sabermetrics were clearly explained in scenes with scout discussions and coaching with the players. There’s enough baseball and saber to keep those who like baseball entertained, and there’s enough of a story-line to keep casual or non-baseball fans intrigued. I came into this film with good expectations, as I do in most cases where I have read the book or am extremely interested in the topic, but this film exceeded my expectations. Sure, there’s creative license that strays from reality, but overall I found the film enjoyable. There are a couple of scenes that are a direct homage to “All the President’s Men” and “The Natural” which I found to be a nice touch. For an extremely polished, Hollywood version of baseball and statistics, “Moneyball” does its job and more. It is definitely an entertaining film worth seeing, for baseball fans and non-baseball fans alike. I, for one, am relieved to find that we have at least one pitcher left on this team. Also, A power hitter. Alfonso Soriano said on Friday night that he is feeling better physically than he has in several years, and the Cubs’ 35-year-old left fielder is beginning to prove it. Soriano hit a pair of homers off D-backs starter Armando Galarraga, helping Carlos Zambrano and the Cubs to a 4-2 victory at Chase Field. Soriano now has nine long balls on the season — the most ever hit by a Cub during the month of April. And Soriano has one day left to add to that record as the two teams play again on Saturday. Soriano led off both the fifth and seventh innings with homers, as the Cubs erased an early 2-0 deficit and ended a four-game losing streak. Let’s hope, Soriano does not go back into one of his trademarked 0-157 ABs streaks and we’ll all be disappointed again. But, as there’s nothing more fun than a dialed in Soriano, let’s enjoy this while we can. How desperate are the Cubs to not see empty bleachers on tv? So desperate that they’ve decided to offer bleacher bums the thing they want most in the world: Beer. With baseball’s attendance down during the first month of the season, the Cubs will offer a few incentives any fan can rally around — T-shirts and discounted beer and hot dogs. The team announced Friday a weekday promotion for fans sitting in the bleachers. On Tuesday, starting with the May 10 game againt the St. Louis Cardinals, select brands of beer will cost $3. On Wednesdays, starting May 11, hot dogs will cost $1 and each Monday, beginning May 30 against the Houston Astros, bleacher-goers will receive a T-shirt. I have a feeling the “select brands of beer” will be Bud Lite, Bud, and Blaatz, but hey, most people guzzled it down in college, so they can hold their noses and drink it now. Cubs back at it tonight in Arizona. First pitch is 7:10 pm CT.
Cubs Live Game Thread: Stopping The Streak. The losing streak, that is. It seems like it’s been forever since we’ve had baseball. Even longer since we’ve had good baseball. Can the Cubs break their three-game winning streak? Will Dempster be forever banished to the land of nod tonight? Will the Real Ryan Dempster please stand up? Tonight, the C- Cubs travel to sunny, dry (sorry, Matt Garza) Arizona to take on the Diamondacks. Believe it or don’t, the Cubs somehow find themselves a mere two games out of first place. I know. I couldn’t believe it, either. For the love of God, Mike Quade, what is your problem with Geo Soto?!?!?! Don’t you understand that playing Koyie Hill is the baseball equivalent of a concession speech? After so many off-days, there is no reason for Soto not to be in the lineup tonight. None. Headed to the hill for the DBacks is Barry Enright (0-2, 6.65), so we’ve got a real pitchers’ dual set here between him and Dempster (1-2, 7.63). First pitch is at 8:40 pm CT on WGN. Not only was yesterday a wild ride to victory, it was a milestone in Major League history. Your 2011 Chicago Cubs became the most mediocre of all franchises, ever. 1-1, 2-2, 3-3. 4-4. 5-5, 6-6, 7-7, 8-8, 9-9, 10-10. The 2011 Cubs are the only team to have each of those records to start off the season. Fresh off yesterday’s thrilling give-up-the-lead-then-come-from-behind victory, the Cubs are back at it today. Will they end today 11-1o or 10-11, and will they continue their amazing path to special levels of averageness tomorrow? If Carlos Zambrano has anything to do with it, they’ll win today. Remember Big Z and the ace performance he had last time out? 8 IP, 0 ER, 10 strikeouts, only one walk? we’ll hope for more of that today. Game time is 1:20 Central, on CSN and TBS and WGN radio. Let’s take two out of three, boys! The season is still young and the Cubs haven’t played as well as I had hoped. We’ve also been bitten by the injury bug with Andrew Cashner and Randy Wells going down. Here’s my thoughts on the team at this early point in the season. Marlon Byrd is hitting the ball really well. I just wish he was in a different spot in the lineup. He’s batting third and that’s where I would want Aramis Ramirez hitting. I would like to see Byrd bat, 1st, 2nd or 5th. I think he would excel hitting in one of those three spots. It would also allow Ramirez to bat third. I think ARAM is a proven run producer and would help us score a few more runs hitting there and Byrd would ignite the offense a little better batting in one of the three spots I mentioned earlier. Darwin Barney has continued to impress me. He plays solid defense and produces with his bat. I think he could be a good number two hitter or 8th place hitter. Starlin Castro also continues to impress. He’s maturing before our very eyes. I am very encouraged with this young man and his play. Alfonso Soriano is hitting with some pop. I know he’s not a stolen base threat anymore, but we could sure use his power if we want to have any success in 2011. Carlos Pena continues to struggle at the plate while playing superb defense. I wish he would stop looking for walks and start hitting the ball. Maybe that’s my perception, but I think he’s too patient at the plate. I would like to see him be more aggressive early in the count. Overall, I’m still hopeful that we can compete in the NL Central. It looked like it was going to be another loss filled with missed opportunities for the Cubs today. After starter Carlos Zambrano exited the game in the 7th with a cramp in his hand, all seemed lost. The Cubs headed into the 8th inning trailing the upstart Pirates 3-0. But that was before the Cubs dropped 5 runs on the Pirates in the 8th, with unlikely hero Blake DeWitt doubling to drive in the two go-ahead runs for the Cubs. Kerry Wood, Sean Marshall, and Carlos Marmol combined to strike out six without allowing a hit in the last three innings. Remarkably, Marmol struck out all three batters he faced and was ahead in the counts the entire time. For the first time in FOREVER, the Cubs are at .500 heading into the series finale against the Pirates Sunday. Matt Garza will make his Wrigley Field debut against Russ Ohlendorf, recently infamous for winning his arbitration case against the Pirates sporting only ONE WIN. Want to feel good about an Opening Day loss? Get ready for it, because here it comes: Fukudome 2-4 with a walk, Castro 3-5, Ramirez 2-5, Barney 2-4, Pena 1-3 with a walk. See what I mean? Okay granted, the Cubs left a small nation stranded on base. But if they keep hitting like they did yesterday, those runs are going to come in. Ryan Dempster served up a pair of home runs while throwing 114 pitches in 6 2/3 innings, and the offense stranded 10 runners on 11 singles. Yet no one in the clubhouse was too down. Those positives included three hits and a brilliant defensive play by Starlin Castro and a pair of hits from rookie second baseman Darwin Barney. But the Pirates continued to treat the Cubs like their personal punching bag, beating them for the 11th time in 16 games since the start of last season. Honestly, the Cubs looked better than they’ve looked in a looooong time yesterday. The middle-infield was spectacular on defense and, believe it or not, the Cubs were actually HITTING. Kind of a lot. And in terrible weather. I’m excited to see what happens tomorrow. Growing up in the city of Chicago, and living here most of my life, I am a fan of all our local sports teams. I was raised in lakeview blocks from Wrigley Field. I guess you could say I’m addicted to sports. To begin with, I grew up watching some form of sport almost everyday. I loved to watch the Cubs on WGN. Sports and baseball provided me with a special connection with my Father. Those were great times! I consider myself a baseball purist to some extent. I love day games, grass fields, and don’t care too much for the DH. I’m happy watching a 1-0 shutout or an 8-7 slugfest. I like players that stay on one team their entire career. I wish MLB scheduled more double headers. I’ve been to spring training in Arizona multiple times. All in all, baseball is my favorite game and the Cubs are my favorite team. In addition to baseball, the Cubs and the Yankees, I enjoy football, basketball, hockey, soccer, tennis, boxing UFC. You name it, I watch it! For the record, Michael Jordan is still the greatest player to ever play basketball in my opinion. It doesn’t hurt that MJ and Ryno each wore 23. What a great number if you’re a Bulls and Cubs fan! I’m really excited to have this blog where I can talk about the Cubs with fans. HAPPY OPENING DAY, CUBS FANS! The Stanley Cup champion Blackhawks come to Wrigley.